A few days back, the first clear renders of Huawei’s upcoming flagship Mate 10 and Mate 10 Pro smartphones had been leaked on the web. 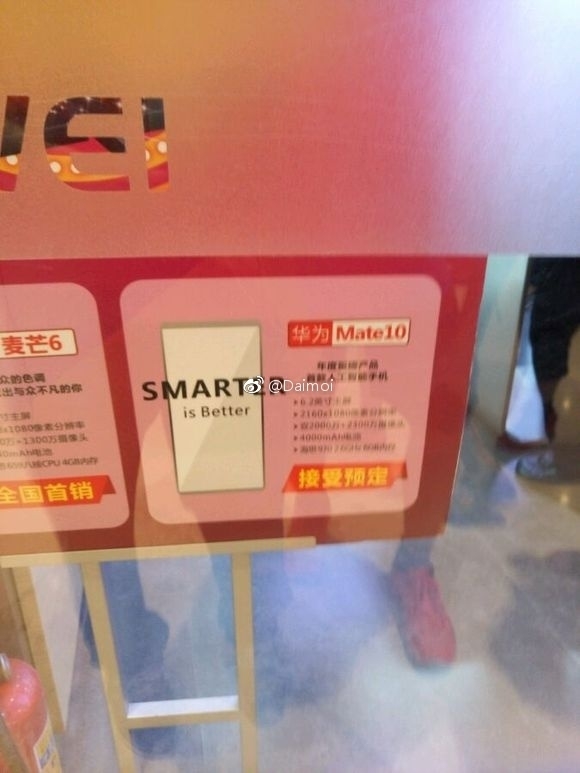 Today, we have a new leak, revealing key specifications of the Mate 10. While all rumors so far had been suggesting that the Mate 10 could feature a 5.9-inch or 6.1-inch sized display, the latest leak suggests the phablet will instead sport a 6.2-inch display with 1080 x 2160 Full HD+ resolution. As expected, the Mate 10 will be running on Huawei’s powerful new Kirin 970 processor, which integrates some advanced AI features as well. The Kirin 960 proved to be a formidable rival to the Snapdragon 821 and Exynos 8890 chipsets last year, so we are hoping that the Kirin 970 too will leave us all highly impressed with its benchmark performance. At the rear, Huawei Mate 10 will apparently feature a revamped dual-camera setup consisting of a 20-megapixel main sensor and a secondary 23-megapixel sensor. Like previous Huawei flagships, the primary sensor will capture color photos while the secondary sensor will take monochrome shots. Keeping the lights on will be a 4000mAh capacity battery, bigger than most other 2017 flagship handsets. In terms of memory, rumors suggest the Mate 10 will be available in three different configurations. The base variant will come with 4GB of RAM and 64GB of onboard storage, while the mid variant will be equipped with 6GB of RAM and 128GB of storage. The most expensive version will feature 6GB of RAM and 256GB of built-in storage. The Mate 10 Pro, on the other hand, is expected to feature a higher screen-to-body ratio than the Mate 10. However, the resolution is tipped to be identical, which would make it a slight downgrade when compared to the Mate 9 Pro from last year. Both the devices are expected to run on the Android 8.0 Oreo operating system out of the box. Huawei will be unveiling the Mate 10 and Mate 10 Pro smartphones at a global media event on the 16th in Munich, Germany.